That’s the question at the center of the film “Unbroken”, a powerful true story about Japanese POW survivor Louis Zamperini. If you haven’t seen it yet, go out of your way to make it the next movie you watch – it’s that good. Louis Zamperini decided if he could not defeat his captors then he would die proving something to them. The most powerful scene in the movie comes after Louis has already endured months of torture from his captors, especially by a prison guard nicknamed “The Bird”. “The Bird” had it out for Louis from day one, as he wanted to prove a point of his own: that the Americans would bow down to their captors. Louis’s strong spirit is a thorn his captor’s side. One day the “The Bird” decides to punish Louis by commanding every other prisoner in the camp line up and one by one punch Louis in the face. The prisoners refuse at first but Louis begs them to hit him. He insists that each man punch him full force in the face. He knows the guards will punish them all severely if they refuse to obey. Louis takes the abuse so that the rest of the prisoners do not have to receive a greater punishment. It’s a heartbreakingly beautiful act of courage. You can’t escape the Christ-like symbolism in this scene. For Jesus was out to prove a point with his life as well. I think sometimes we don’t talk enough about this aspect of Jesus’s sacrifice. His death was not just to save us, which of course was of the utmost importance. But I believe Jesus died in the way that he did for a reason. Jesus went to the lengths that He did – dying in such a dramatic and public fashion, in a story that would be told through the ages – to prove a point about how far he would go to save us. He wanted His death to not only rescue us from sin, but to provide a picture for us to look toward for inspiration when we reach our breaking points. Later on in the movie Louis endures another harsh punishment. He is forced to lift a heavy wooden bar above his head. “The Bird” says he will shoot Louis if he drops it. I don’t think I’m spoiling the movie by telling you Louis holds the bar above his head far longer than he should be able to. The other prisoners and guards stop everything to watch him. They cannot help but stare in awe and wonder at Louis’s might and determination. His acts of courage and defiance in the face of fear inspired everyone around him. In the same way Jesus knew the importance of of not just the act but the image of Him holding the cross. He wanted us to have a picture to look toward in our hour of need that would encourage us to stand tall and push the bar of despair over our head with an otherworldly strength. Most of us will never be pushed to our limits like Louis Zamperini was. But for some it’s a great struggle to just make it through the day without reaching our breaking point. So when you get pushed to your breaking point, close your eyes and reflect on the picture Jesus painted. Look to your savior who took the beatings and the temptations but remained unbroken through it all. Reach out for his hand – pierced but steady, beaten but unbroken. 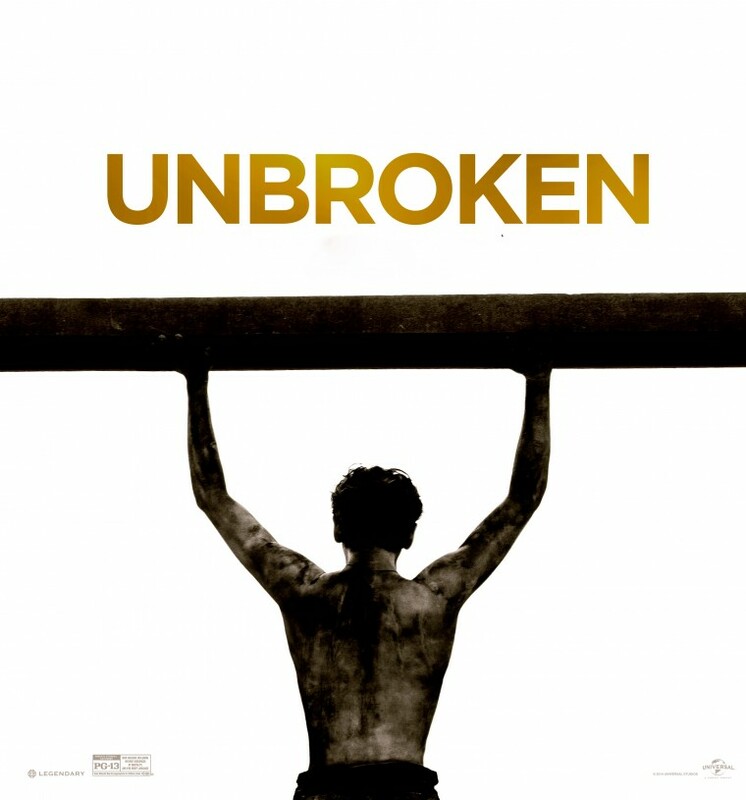 Have you seen Unbroken? What did you think? What do you do when you hit your breaking point?